• Electronic push button timer. • Select from 10, 20, 30 and 60 minute timed operation of fan. 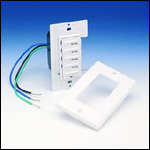 • Includes Decora style white switch plate and screws. • Fits standard single gang box. • Ideal for multiple switching locations. • Switch suitable for 115 volt supply. 20 amp rating.